As the Chief Medical Officer of Physician Partners of America, Dr. Abraham Rivera understands the importance of giving back. He is well-known as a physician, leader, peer educator and lecturer. 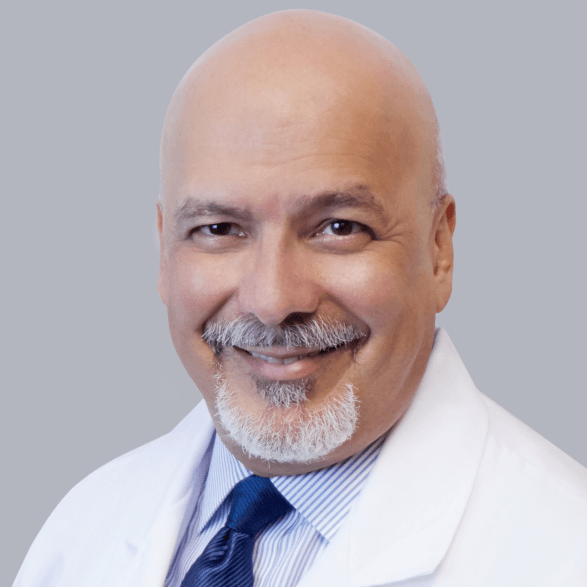 Dr. Rivera is a current board member of the Florida Academy of Pain Medicine. His advocacy for opioid-prescribing reform earned him the organization’s Felix Linetsky, MD Award for Excellence in Education in 2018. Engaging and energetic, Dr. Rivera is known for his compassion in treating countless patients. He is also committed to educating medical fellows and residents, and other physicians on the latest advances in medicine. In his primary role, though, Dr. Rivera is the Chief Medical Officer for Physician Partners of America, which is the parent company that owns and operates pain management practices in Texas and Florida. The company owns and operates several ambulatory surgery centers, pharmacies, and laboratories. As PPOA’s official spokesman, he has represented the company in countless media appearances related to pain management and opioid prescription reform. A board member of the Florida Academy of Pain Medicine, he earned its Felix Linetsky, MD Award for Excellence in Education. The award recognized his leadership in organizing a landmark Opioid Summit in April 2018. He is a thought leader in the technology sector of the healthcare industry, as well, serving as a consultant for medical device-manufacturing companies. Born in Georgia to Puerto Rican parents, Dr. Rivera is a graduate of the University of Puerto Rico School of Medicine. He completed his residency in Anesthesiology and Pain Management at Albany Medical Center in New York. In his free time, Dr. Rivera is a pilot, and also loves to stay active with golfing and scuba diving. We are grateful that you have taken out the time to express your appreciation for the doctor. We all thank you very much and value your feedback. My experience with Physician Partners of America, specifically Dr. Clavo at Texas Pain Relief Group, was very much the same. They completely disregarded my concerns with him after he told me to sit, like a dog, and wouldn’t allow me to leave the room until he gave me permission. He also bad-mouthed my previous doctor whom had treated me at that office before he arrived. She had given me excellent care and I spoke very highly about her to him. Apparently he was quite threatened by my respect for her. He went as far as to to tell me she had limited experience and didn’t know what she was doing. Which was ludicrous, she had a long history in pain management and did her residency at Johns Hopkins. Clearly she’s no fool. I reported my traumatic experience to the corporate office where I was told I would be contacted about my concerns. That never happened. Clearly they do not care how badly their patients are treated. I have found a wonderful new pain management doctor who is extremely competent, caring and cautious. It was a very much a blessing in disguise to have gone through what I did to get to where I am now. But I feel I should warn other unsuspecting patients who may try this crooked medical group in dire need of compassionate care. You will not receive it here. I would give them 0 stars if I could but at this point I give 0... well, you know the rest. we regret to hear that you had a negative experience with us, as well of any complications you may have gone through. We want you to be a satisfied patient within our capacity as interventional pain management specialists, and want to turn your experience around. Please email us at customerservice@physicianpartnersoa.com so we can have the clinical staff review your case and we will definitely reach out to you. A humble, kind, compassionate physician. Listened attentively, discussed treatment thoroughly. My daughter has Chronic Regional Pain Syndrome caused by an accident more than 20 years ago. Dr. Rivera's attentiveness and support were exemplary. Most impressive was the fact that he was never threatened by, nor dogmatic about, seeking complementary or alternative treatment methods. He was happy to entertain numerous options. His concern was always for what could best help the patient. When we at last found a treatment that worked wonders for her, and that has kept her almost pain free for 20 years, he rejoiced with us and said that he would mention this to other patients, as well. I have many medical problems and have been to many doctors that made me feel inadequate and lacking pain tolerance. Dr. Rivera is one of a kind. He is always up, happy to see you, caring, listens with both ears, and kind. He knows what he is talking about. Six other doctors saw me and questioned what kind of rod was in my lower spine. When Dr. saw it he immediately said it was a pedicle screw. And it was responsible for the bulk of my pain because it didn't belong there & he had no cure for me. We view the situation differently, but do appreciate your comment. Please know we take it seriously. We have escalated your concern to Dr. Rivera and our other senior management for review. Great advice on the knee pain I have been experiencing for years. I've tried everything and now it's time to listen to the doctor! Thank you Dr Rivera! The only negative thing I have to say about Dr Rivera is that he's not there more. I've seen several pain docs,and he's by far the best. He looks at you when you're talking and truly listens. So happy I found him. First time for me yesterday and my impression was positive. He is indeed a great Doctor, he listens and spend time with you. He is very professional. First impression means a lot. Thank you for the kind review. Dr. Rivera (who is also our medical director) is a wonderful, compassionate and very knowledgeable doctor. We are honored to have you as our patient, Johanna. Dr. Abraham Rivera is one of the kindest, caring doctors I have ever had. He has been my pain management doctor since 2014 and I cannot think of a more respected doctor in the 75 years since my birth. I would sincerely recommend him to anyone who had a genuine problem with pain. He is helpful, caring and has your complete attention when you bring him a problem you cannot deal with on your own. I thank Dr. James Billys for recommending him to me. Thank you for the compliment, Ms. Keyles. We value you as a patient and will pass along your kind words. Dr. Rivera is incredibly well-versed in all aspects of pain management. While this alone would make him a good doctor, what sets him apart from other physicians is his capacity to listen to patients, truly hear them, express empathy, and take action. He is exceptional because he is present and compassionate--rare qualities in a high volume specialty practice setting. I wholeheartedly recommend him. 1st appointment and they called a day ahead to change the appointment time. I agreed to the change because I wanted to see a Doctor and not a PA. Arrived as scheduled and no Doctor to be found. Had to see a PA anyway. Ordered 2 MRI's and scheduled a follow up for 2 weeks later. Insurance dragged their feet on the MRI's so I had to re schedule the follow up. Ran out of medication because of the later follow up date. Called 4 times to get medication refilled. No return call, no refill, no response. My insurance uses Quest diagnostics. I told 3 different people at the office on 3 different occasions that all specimens had to go to Quest Diagnostic Labs. they assured me that they understood and that any labs would be sent to Quest. They sent it to their in house lab instead of Quest. My insurance refused payment as they are out of network, and I got a $9880.00 bill. DO NOT USE THIS PRACTICE. Dr.Rivera is one of the best doctors I've ever had . He is very caring and take time to listen to my questions . I have been with him for years . I have a baclofen pump and also pain that he is managing . I trust him . I have not been very happy with his staff . A lot of confusion and errors have been made on their part . Great Doctor!!! Caring and Very professional. Dr. Rivera is pretty amazing. He is the BEST!!! I have seen numerous Doctors in the past with no relief. He is the only Doctor that has given me relief from my back and neck pain. He also has a great bedside manor and takes the time to explain. Would highly recommend him and have to many of my friends who suffer from neck and back pain. Poor understanding of the fact that even younger patients can and do require treatment for chronic pain. Refused to look at MRI's that had been recently completed because he "knew from looking at me" (face to face, no physical exam at all) that I was too healthy to have suffered a disc lesion. The MRI and evidence he discounted was from another pain management specialist in the same company, and at the same location. Worst Dr. I have ever been to! Judged me within first 5 minutes of seeing me... didn't ask any questions about medications taken... and basically kicked me out of his office telling me he was not the right physician to treat me!!! I will not only not be going back there... but I had a ton of people waiting for me to refer them... wont be to him!!! What a jerk!!! I had a great experience with Dr. Rivera. He treated my back pain and I feel better than ever. I had to wait for a while to get in with him, but it was worth it. Dr Rivera is a fine man even though I rated him low. He means well but he is extremely hyper and really really has problems listening to me and my needs. He implanted the morphine pain pump and he did an excellent job but getting him to understand what your trying to say is futile. The morphine itself I believe is not doing me well but he wants to do more surgery to see if the catheter in my spine is properly placed. Another huge bill I can't afford. I can tell there is no problem there I just don't like morphine distributed this way. Its hard to explain in simple terms but he needs to slow down most of all and improve on listening and clear out his cell phone mail box so a person can leave a message. I don't think I have ever been put on hold here for a long time and am so impressed with how quickly all of my questions are answered. There's nothing worse than having to wait on hold for a half an h our just to get someone to talk to you. They had quite a few interesting magazines, which made my time in the waiting room go by much faster. They are completely committed to helping me as long as it takes to find the best solution. I never have to worry that they'll back out or give up if a solution isn't reached immediately, which has been a problem for me at other places. I always have the best experience every time I have an appointment here. Although I have not had much to complain about, I have noticed that they strongly adhere to the customer is always right policy and if anything goes wrong make every effort to correct the situation. Whenever I make an appointment, I'm always confident that they're going to be ready for me at my scheduled time. At other places I've been to, it's always bothered me when they postpone my appointment, but they've never done that here.